It has been said that we should play smarter, not harder. The only problem with this half truth is that in sports, even after you’ve played smart, you still need to play hard. And at the end of the day, the physical part of the game still needs to be played, and still needs to be won. The US Men’s Soccer Team had heart, they had soul, but they lacked “physicality.” That’s the new, made up sports word sports commentators like to throw around when they talk about physical teams and physical players. Technically sound and mechanically correct players don’t grow on trees. And so in the World Cup, and at all of the high levels of sports, an athlete that is technical and mechanical is a good thing. Thus, physicality certainly helps, and the lack thereof certainly hurts. There are some things that there’s no substitute for. And there’s no substitute for size, power and speed. None. You need height to be a basketball player, you need strength to be a football player (American Football, that is) and you need speed (or at least agility) to be a great player in almost any sport. At least not having any of these doesn’t help, and having any of these doesn’t hurt. If there is no substitute for heart, and there’s no substitute for soul, it follows that there’s no substitute for having a “body.” Playing virtually does not equal playing actually. You can draw up all of the X’s and O’s you want, but if you don’t execute, it means nothing. The US Team gave it a go, and it almost seemed as if the US would be able to sing the high note of, ” . . . La, Tee, Doe!” – but alas, it was not meant to be. Belgium out ran, out muscled and outplayed the US for 120 minutes. Nough’ said. 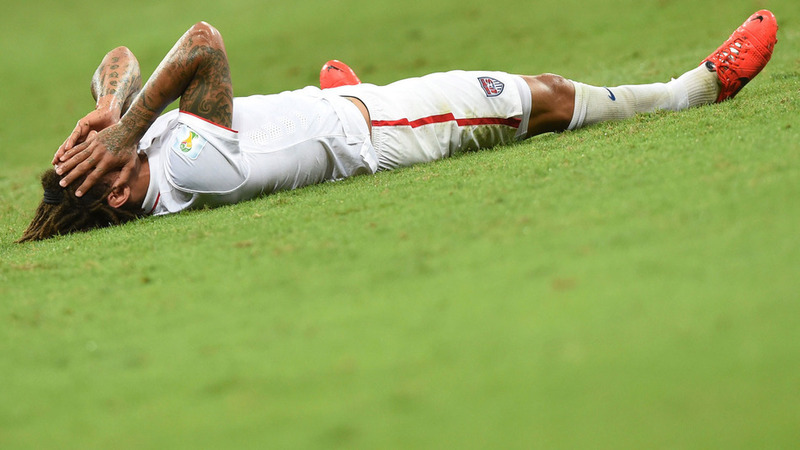 On the other hand, the US goalie, Tim Howard, made 16 – count’ em – 16 saves in the match against Belgium. That’s a new World Cup Record. So even if the effort is great, and even though the endeavor is grand, in the end, you still need for it all to come together at the right time. And the reality of that truth only hurts all the more after you’ve played your heart out and still come up short. As we say in America, the solace is, wait till next year (next World Cup). So we should be proud of our US Soccer Team, because they had nothing left to give after they gave it everything they had. Next > What If Our Best Athletes Played Football?